Jonathan Demme's documentary I'M CAROLYN PARKER takes a different approach to Hurricane Katrina from Spike Lee's masterful sweeping lament, WHEN THE LEVEE BREAKS, or from David Simon's TV series TREME. Rather than looking at the consequences for an entire community, and railing against the political and bureaucratic incompetence and callousness, Demme tells the story of Katrina by focusing on a single woman, and because of her indomitable and positive spirit, the movie comes across as more hopeful than its precursors. The documentary takes the form of a interviews with Mrs Carolyn Parker, resident of the devastated Lower Ninth Ward, between 2006 and 2010. Demme visits her when she returns to New Orleans and lives in the water-damaged shell of her house, newly reunited with her brother and supported by her daughter. As the months pass, we see the arrival of the cramped FEMA trailer - a logistical constraint that doesn't prevent the former Chef from cooking up some amazing fried turkey! The Federal money eventually comes to start rebuilding her home, but in a familiar tale, contractors are scarce, honest contractors even more so. Finally, through the work of volunteers, the house is eventually put right, but not before five years have passed. Along the way, we see Mrs Parker battle with local politicians; the Catholic Church; and endure a double-knee replacement. She tells us tales of segregation and racism; always with a sense of humour that counter-acts her anger. What amazed me was how she never came across as bitter - her anger is always used constructively. She's an activist in the best sense of the word. Technically, the documentary is no great shakes, and it's narrow scope might make it seem somehow less important than other treatments of Katrina. There is no great revelation - although there is an hilarious interlude where some charitable Brangelina backed Europeans are throwing up an art installation. But the movie remains worth watching and highly memorable because of the character of Mrs Parker - an inspiring and humbling figure. 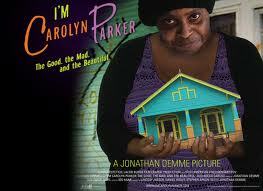 I'M CAROLYN PARKER played Toronto and London 2011. London Film Fest 2011 Day 13 - W.E.